Um, yup, its been a little while, but thought I should actually get around to slapping up a bit of a report on this brilliant weekend I got to be a part of. So, the Aus7 group (dedicated for O scale modellers of Australia) has been around for 10 years. Normally their gatherings are a bit of a closed forum type of event, but to celebrate this little mile stone, they decided to organise a one day public exhibition, promoting the art of O scale modelling. Held at the old Casula Powerhouse, which has been converted to an amazing arts centre, it was billed as an O scale only exhibition...that doesn't tend to happen, ever. In my years of exhibiting, as an O scale modeller, you often feel a bit like the odd ones out. With the dominant scale of choice, especially at exhibitions, being HO (even as far as all the trade offerings, its a bit rare to find anything O scale for sale at exhibitions), the whole O scale thing is kind of left to the modeller to do their own leg work and learn about it. To have the chance to be involved in this O scale exclusive event was a bit of a dream come true. So, with all my bits for display packed into the car, I made the long drive up to Sydney for the show. I was up there to display some of my tree modelling results (took the Splitters Gorge diorama for show, and also my Diggers Bend layout, which was its last show with me, and handed on to a new owner up in Sydney), and spend the day hosting a repeating series of tree clinics for the day. 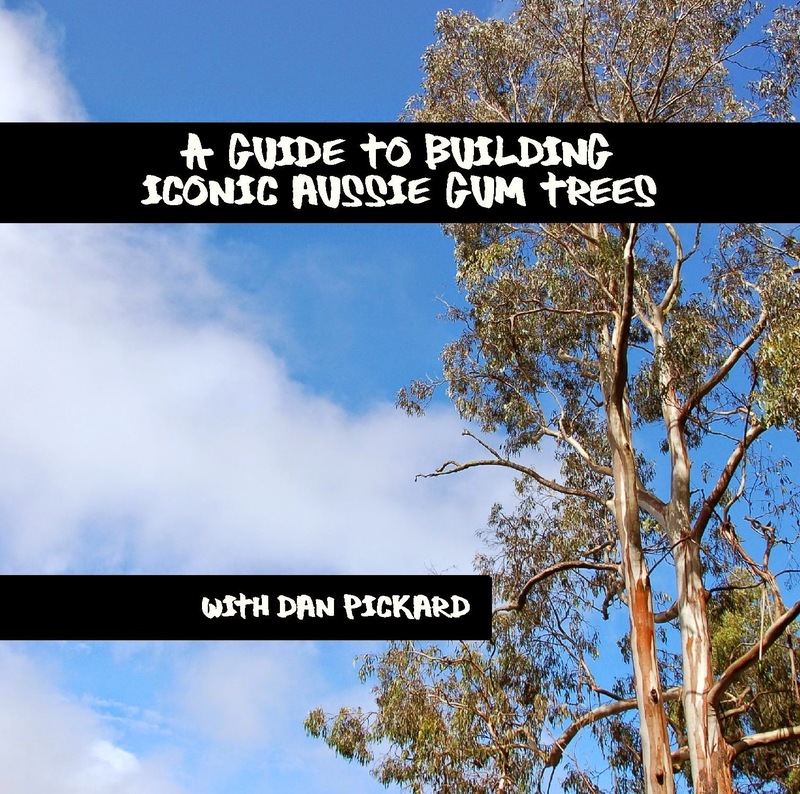 That clinic normally runs for about an hour if I do it at a convention, but for the sake of this event, I was able to condense it down to about a 20 minute overview of how to build a gum tree. I mentioned the venue, the old Casula Powerhouse...cool joint! Heaps of industrial features, old iron and concrete mixed with some modern artsy features. Excellent venue, and a really venue, which seemed appropriate for this different sort of show. Set up for the show was pretty smooth, and also a great chance to meet some of the other modellers who I had only conversed with via web forums. It was cosy little group of exhibitors, and we got the share a nice meal at the venue that night after setting up, dining whilst surrounded by a decent display of modelling creations. The show was held for just the one day (March 1st, 2014). Weather was a challenge that day, as I think we ended up having almost 40mm of rain that day. Not really ideal weather for getting out and about! Still, the show goes on. It was a quieter day as far as exhibition attendees, but I think we expected that given the nature of the show. The venue was still full, but had a decidedly different feel than a normal exhibition. Not sure if the venue had anything to do with this, but it had a far more relaxed atmosphere. To me, it felt more like an art show. Not so much pushing and shoving to see displays, and being run over by prams and charging kids (in fact, I didn't really see too many kids at all). This was a more mature sort of crowd. Quiet, and seemed more respectful of what they were there to see. I think a lot of attendees spent more time there slowly wandering through the displays, and taking the time to really appreciate the efforts some of the modellers had gone too. Without a doubt, one of the most comfortable railway exhibitions I've had a chance to experience. As for my tree clinics, I ended up repeating the session 7 times through out the day, plus numerous brief extra sessions between scheduled times for all those still with more questions. It was good to sit with small groups each time with keen interest in seeing how this tree thing all happens. They must have been interested because I parted with a good number of the CD's I've produced with all my tree clinic notes. I was fairly spent, and just a bit hoarse by the end of the day, but it was a very rewarding thing to be a part of. The other modelling on display was exceptional. One of the things I've always appreciated about O scale modelling, is there is often more attention to detail with this scale. There was no shortage of that. A number of the layouts were built specifically for this show. Some never intended for public display, but some huge efforts (O scale is a big scale, including some of the huge module son display!) to get them there for a rare viewing. All seemed to run well, and all well appreciated. The other part of this show that made it so special was the efforts made by the organisers to look after the exhibitors. Accommodated at the nearby super comfortable Mecure hotel (I'm not likely to get model railway exhibitors accommodation like that ever again! ), well fed on both nights at the Arts Centre and also back at the Mecure on the Saturday night (with a great presentation night), as well as the full cooked breakfast to fill up on each morning. That alone was worth the drive, but the models I got to see, and modellers I got to meet, made it even better. I would never expect any other exhibitions efforts to come close to this show (I mean, it was a one off event for a reason), but the level of professional presentation on behalf of each of the layouts was highly appreciated, and really took it to more of a display of artistic creations, rather than the usual rambling bunch of train guys with their stuff in a hall. As I made the long drive home with a couple of other local Victorian modellers (Laurie Green and Grant McAdam), it was also a great opportunity to call in on another good modelling friend, Murray Scholz, (Bogong & Geehi Railway) and check out his layout progress. A big thankyou to Murray and his family for sharing a much needed lunch (and break from driving), and giving us a tour of his efforts out in his modelling shed. Always great to see what other modellers are doing, especially when its based around a similar prototype to what my interests are, and see how they are tackling the process. Please make sure you check Murrays Bogong & Geehi blog for his layout updates. So home again, with a bunch of new ideas and new inspirations. Time to find some more time in the shed. Time to build a new shed!